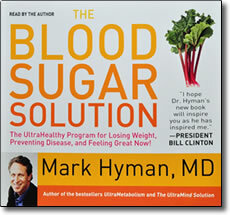 The Blood Sugar Solution – audio CDs or MP3 by Dr. Mark Hyman – Save! Preventing Disease, and Feeling Great Now! Have you tried to lose weight but can’t seem to get rid of those extra pounds? Do you suffer from cravings that sabotage your best intentions? Have you been diagnosed with high blood sugar or type-2 diabetes? Do you feel run down, tired, or unable to manage your stress? As a society we are inundated with information about healthy lifestyles and disease prevention. Yet, we are fatter, more tired, more disease ridden, and have a higher incidence of diabetes than every before. What is the solution? Mark Hyman has been helping individuals lose weight, feel better and avoid health problems for over 20 years. Now, in The Blood Sugar Solution, he presents an easy-to-understand, easy-to-implement solution that addresses the root of the problem once and for all. The trick is to prevent what Dr. Hyman calls “diabesity” (the problem of obesity-induced diabetes). By 2020, nearly half of Americans will have some form of this condition. The good news is that all of this is preventable–and even reversible. Mark Hyman’s straightforward six-week life plan makes losing weight and preventing disease natural and delicious. You’ll feel great not only knowing the HOW of weight loss, but also the WHY. You’ll notice more energy, vitality, and mental stamina. In addition to losing weight and preventing diabetes, Dr. Hyman’s Blood Sugar Solution will help you reduce the risk of heart disease, dementia, cancer, and stroke through balanced insulin levels. Based on the latest research findings, The Blood Sugar Solution is the fastest way to take control of your health, pump up your energy, and prevent disease. Includes a PDF guide containing charts, graphs, quizzes, recipes, and the six-week meal plan.